Julio Arce and Frank Buenafuente Rematch at ROC 58 | Lou Neglia's Ring of Combat | Next Generation of Mixed Martial Arts! Julio Arce (10-2) and Frank Buenafuente (7-3) look to pick up where things left off last year as the two will one once again battle it out for ROC gold when Ring of Combat takes place at the Tropicana Atlantic City, New Jersey, on Friday, February 24. “This was such a great fight the first time around that we just had to do it again,” said Ring of Combat President, Lou Neglia. “Taking the immediate rematch is what sets these two combatants apart and will prepare them for the next level of MMA,” Lou continued. The Ring of Combat Bantamweight National Title will also be on the line as Serra-Longo fighter, Merab Dvalishvili (5-2) takes on Brooklyn MMA's very own Sukhrob Aydarbekov (2-2) for gold. Dvaslishvili currently rides a four-fight win streak while Aydarbekov is riding a two-fight win streak. The ROC Regional Bantamweight Title will also be on the line when New Jerseys, Ricky Bandejas (8-0) takes on New York's Paul Grant (3-0). Bandejas comes into his title fight with a flawless record as Grant looks to add one to the win column. Going for the Ring of Combat Welterweight Crown is Tajuddin Abdul-Hakim (4-0) who is set to battle Sidney Outlaw (6-3). Hakim has yet to taste defeat while Outlaw nearly won the ROC lightweight title against Gillespie where he fall to a close split-decision. The remainder of the card is as follows: Dominick Biondo (3-2-1) vs Brandon Urquijo (1-0); Pat Sabatini (5-1) vs Michael Lawrence (4-1); Tevin Cooke (3-0) vs James Gonzalez (2-1); Joseph Schick (0-1) vs Jerome Mickle (2-1); Phil Caracappa (5-3) vs Tommy Espinosa (4-2); Michael Trizano (2-0) vs TBD; Travis Foster (0-2) vs Nick Fiore (1-2); Michael Elshamy (3-3) vs Willie Hosch (4-4). 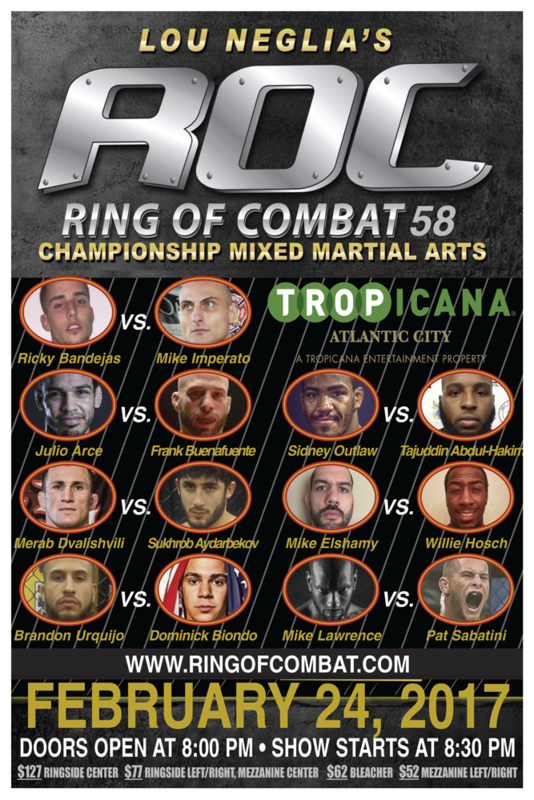 Ring of Combat 58 will take place February 24th at the world famous Tropicana Atlantic City showroom.